Reishi mushroom (Ganoderma lucidum) is one of the most highly respected botanicals in Chinese herbal traditions. Regarded as the “mushroom of the immortals,” it has been used for thousands of years to preserve health, support mental calmness, and promote longevity. Reishi is also one of the broadest-acting immune modulating herbs, with a wide spectrum of actions in comparison with many other botanicals researched, including anti-allergenic, antitumor, anti-inflammatory, antioxidant, hepatoprotectant, antiviral, and a host of other beneficial activities. Analysis of reishi is challenging, as there are numerous chemotypes, species, forms, and preparations that are used. The most significant analytic need is to distinguish between species, most notably, Ganoderma lucidum and G. sinense, and then to distinguish between fruiting body and mycelium products. 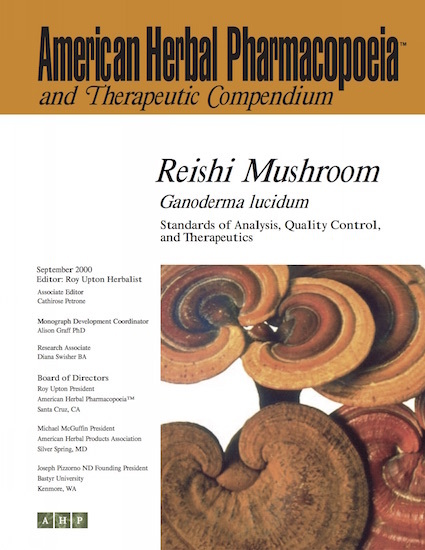 The AHP monograph addresses many of these issues, though further investigation is warranted, since there is no single characterization representative of reishi.